How important is honesty? When is it okay to fudge on the truth? If the main point is valid, how necessary is it to keep all of the details straight? I just read a bizarre story that got me thinking about this subject. A director of Senior Services in Rhode Island wanted to promote snow removal assistance for the elderly, and couldn’t rustle up a suitable “Cranston Senior Home Resident” to be featured during a news report. So, she did the next best thing. She manufactured one. The only apparent flaw in her plan was forgetting that such facilities also have male residents. So, the bus driver she pressed into the role had to don a wig, makeup and earrings. (Perhaps she just thought that an elderly female would elicit greater sympathy. At any rate, her nefarious plot was revealed when local television viewers did not fall for the questionable disguise. The coup de grâce, or the punch line as you may read it, came in the pronouncement of the salon owner who prepped the man for his debut. You see, the problem wasn’t the misrepresentation. The error was in not doing it persuasively. C.S. Lewis thought a great deal about the subjects of truth, and deception. For much of his life, well into adulthood, he was deceived by sirens who denied the reality of a loving God. One of his accurate observations is that deception must be reasonable to be successful. Obviously, the incident above did not pass the plausibility standard. In the same essay, Lewis declared scenarios that represent imaginary realities as being innocent of deception. No one can deceive you unless he makes you think he is telling the truth. The un-blushingly romantic has far less power to deceive than the apparently realistic. Admitted fantasy is precisely the kind of literature which never deceives at all. Children are not deceived by fairy-tales; they are often and gravely deceived by school-stories. Adults are not deceived by science-fiction; they can be deceived by the stories in the women’s magazines. (“An Experiment in Criticism”). We would be inclined today to add “men’s magazines” as an equally disingenuous source. I believe Lewis was referring to the kind of story that manipulates one’s emotions and exaggerates reality to provoke the desired response. As a Christian, Lewis reflected in great depth on how prone you and I are to deceiving ourselves. Some of this self-deception is not intentional. In correspondence with an American acquaintance he discussed Martin Buber’s book, I and Thou. What I had not yet thought about was your objection, that he ignores the Me. You are probably right. He might even have said that just as the Thou is deeper than the Me, so the I is deeper than the Me. For I believe self consciousness to be full of deception and that the object I call me and think about (both in my moments of pride and in my moments of humility) is very different from the I who think about it. I agree with Lewis that we are often unaware of aspects of our own personality. And, unfortunately, we are prone to misperceiving what we do observe. This is not a conscious twisting of the truth to our own benefit, as in proclaiming that we are exceptional and never fail. This raises the question of our self-awareness. The Johari Window is a simple resource that illustrates the four aspects of our identity, based on two axes—what is known/unknown and by whom the traits are recognized. You can see how it works out in this simple diagram. And you can read a brief description of the tool here. It seems evident that one key to living with integrity and enjoying greater happiness is to be honest in all of our dealings. Honest with others. And honest with ourselves. It was good to be reminded once again of that vital truth. Here’s a piece of Lewisian trivia. The collection of essays available in the United States as God in the Dock was originally published in the United Kingdom with the title Undeceptions. Ironically, the British reference in the American version of the title still creates confusion for those who don’t realize “in the dock” refers to a person who is on trial. I was recently reminded that February 2012 marks the seventieth anniversary of C.S. Lewis’ masterpiece, The Screwtape Letters. Other bloggers have remarked on the anniversary, for example here and here. Lewis dedicated the book to his dear friend and fellow Inkling, J.R.R. Tolkien. If you’re unfamiliar with the letters, you really should rectify that gap in your knowledge. 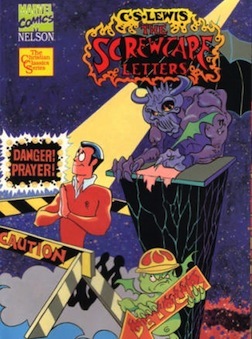 The letters are penned by Screwtape, a senior Devil, to Wormword, a less experienced tempter. They illuminate Satan’s demonic tactics and provide keen insight into our fallen human nature, replete with its countless vulnerabilities. There’s even a graphic novel version of the collection which was published in 1994 by Thomas Nelson in partnership with Marvel Comics. While the anniversary of the Letters in and of itself is certainly significant enough to merit a blog announcement . . . this post includes something quite rare. The fact is we’ve come into possession of one of Screwtape’s instructional emails, written to another subordinate demon. For the benefit of those who would arm themselves against the snares of the Enemy, we reproduce it in full below. Another decade has passed since that puppet of the Enemy released to the world a portion of my correspondence with Wormwood. Of course, the lamentable Wormwood has had ample time to regret his carelessness in that matter, as I often remind you. A decade’s but a snippet to immortals such as us, of course, but to the mortals it marks a significant portion of their brief lives. Why the Enemy loves those pitiable insects so much goes beyond logic! Still, another halfscore has flown past and that damaging treatise remains in print. In fact, if anything, it continues to grow in popularity. We simply cannot have our “patients” made aware of our treatment regimen for them. If they come to realize that our most successful deception is untrue, the relentless work of centuries will be undone. We have labored tirelessly up to the present day to persuade humanity that all truth is subjective! Fortunately, the vast majority of the population in what are ironically labeled “enlightened nations,” has accepted our suggestion. This allows them to eagerly swallow the comforting lie that “all roads lead to god.” If they realize that all roads do indeed lead to a ‘god,’ they might abandon one of the many paths that lead to our Master who is ever-eager to “swallow” them in turn. But, back to your primary concern my appetizing friend, your patient. By all means keep him from reading The Screwtape Letters. In fact, the farther you keep him from anything written by Clive Staples Lewis, the better! Keep him in the company of liberal companions who have embraced the myth of there being no objective truth. That way, we can prevent him from ever meeting the Enemy who proclaims himself to be—yes, disgusting isn’t it—the Way, the Truth and the Life. Never pass up an opportunity to impress upon your patient that such a claim is politically incorrect to the utmost. Remind him he will be shunned by society if he argued there was a single truth. Indeed, make him think the very suggestion that anyone sincerely following another path might be lost, is repugnant. Many of your fellow tempters have experienced great success in motivating the humans they treat to replace in their world views the virtue of Truth with the sentimentality of Sincerity. This you must do as well. Persuade him that the eternal destiny of all who believe in something, is secure. Convince him that it is by their sincerity that they are saved. Oh how sweet it is when they accept this dark epiphany! And it has never been easier to win humans over to this view than it is today. If you wish to embellish the doctrine with vague language about “God being love” and all that, so be it. Just see to it that they never open the Enemy’s book to recognize how grossly they have edited and distorted that concept! Do whatever it takes to ensure that your patient never reads the Letters! And, be wise to guard our own correspondence, lest you end up in the agonizing company of the afore-censured Wormwood. *Esculentus translates from the Latin as either “delicious” or “succulent,” and if you have read The Screwtape Letters you know what that suggests about Screwtape’s interest in his protégé.